Another rusting relic this week for the corrosion fans to enjoy. I thought that something should exist for cars, buses, vans, lorries and motorcycles. When I look into it the nation’s favourite auction site is casting up many dozen examples of rusting relics. Many that require extreme bravery and much metalworking skill. One of the advantages of Spain (from a metal perspective) of course is that it is beautifully dry. That is not to say that signs of the corrosion beetle are absent. The sills on this example look worthy of some close attention. 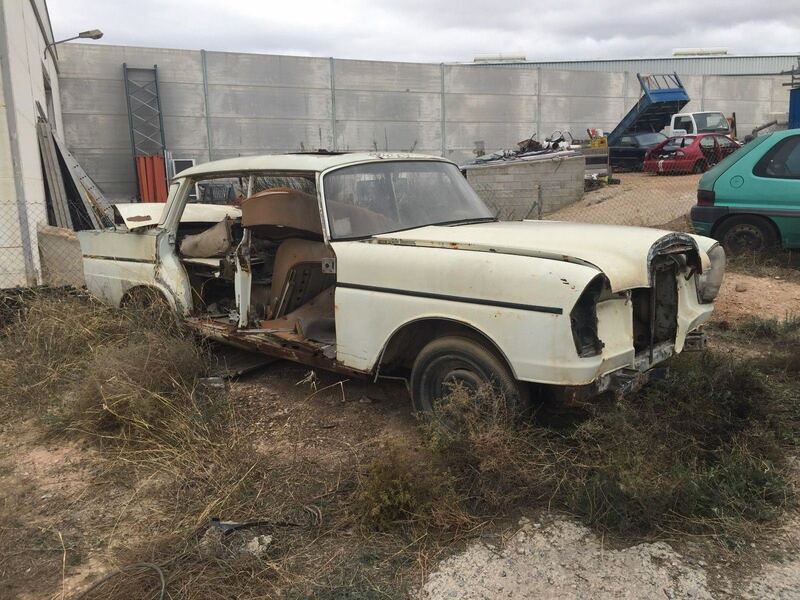 Although listed as suitable for spares I am not certain what spares you will be able to glean. For a start there are no doors and the car interior is more like a shed. The seats are squeezed into it and look torn and stained. Fortunately front and rear glass is in place. Confusingly the listing states the registration date is 08/10/1964. 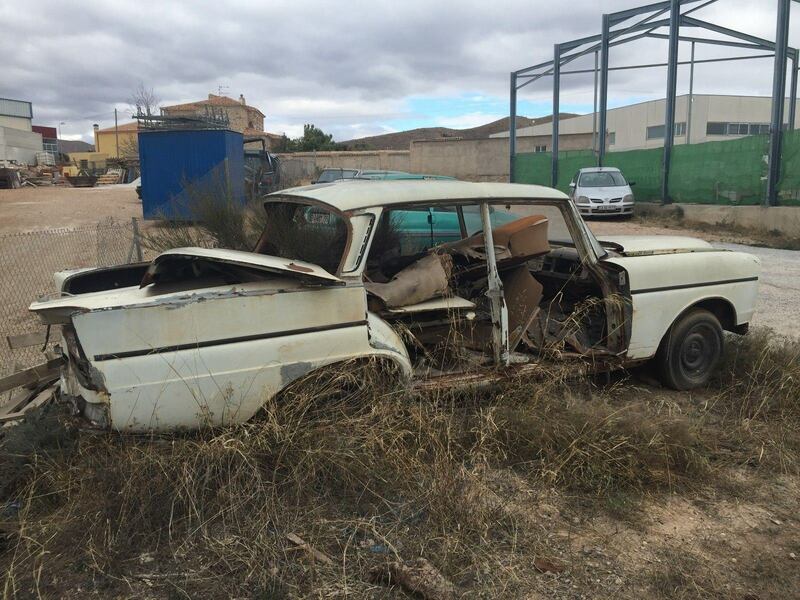 But in the same description also maintains that it is a 1967 Mercedes 220. I’m not certain how those two things can coexist. The 220 reputation is for being bullet proof. Indeed the body on this seems to have survived moderately well. But a lot of parts are missing – this picture has no sign of an engine for example. It looks like this car was a donor in the past. One of those magnificent stacked headlights is missing. As is the proud chrome grill. 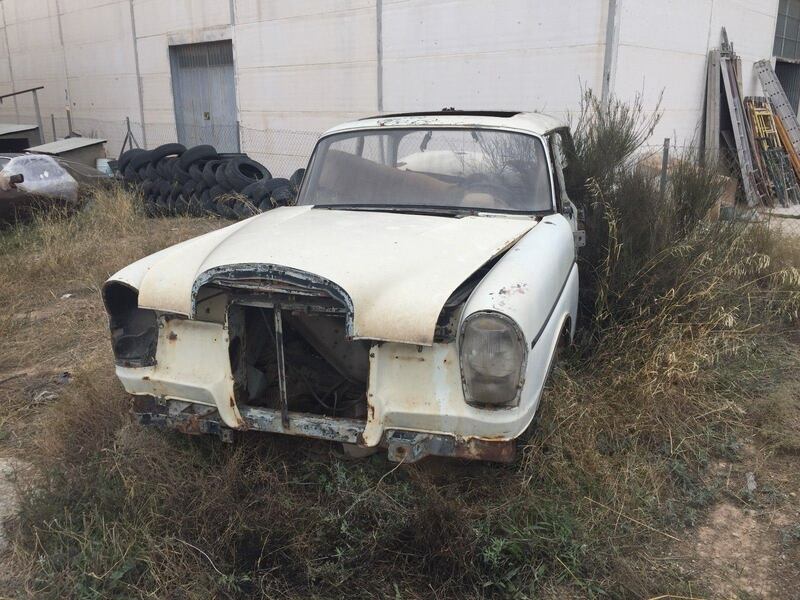 A quick scan of the Internet reveals that the 220 is well served with parts however https://www.niemoeller.de/en/mercedes-benz-oldtimer-spare-parts/spare-parts-catalog-mercedes-benz-170-220. I’m taken by the location which looks like a cross between a wasteland and a prison yard in these photographs. The price seems low at £500 (currently with no bids). But a better prospect is https://www.classiccarsforsale.co.uk/mercedes-benz/220/223226 at €4,850. (Although it lacks the stacked headlights I notice. This one looks even better https://www.classic-trader.com/uk/cars/listing/mercedes-benz/fintail/200/1967/117659 at £22,098. So it does look like these 200s fetch a reasonable sum. 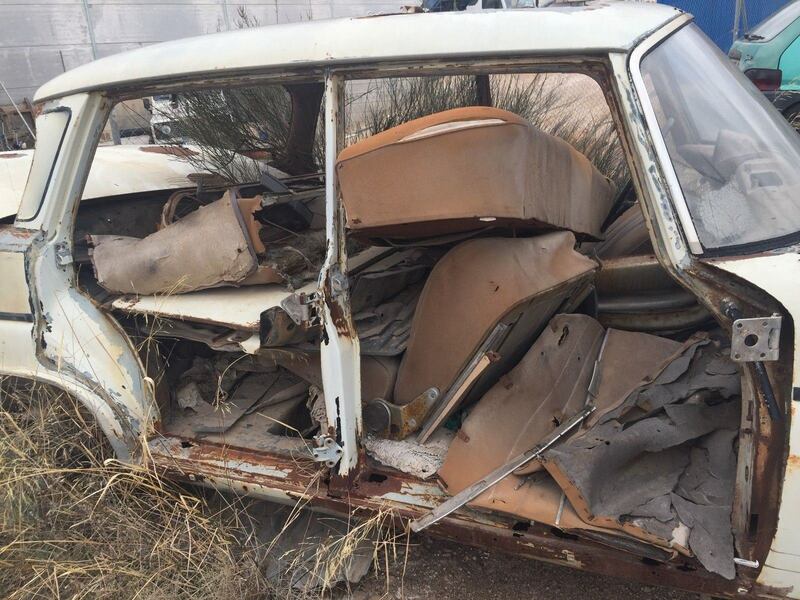 However at the end of any restoration you would still have a left hand drive car. 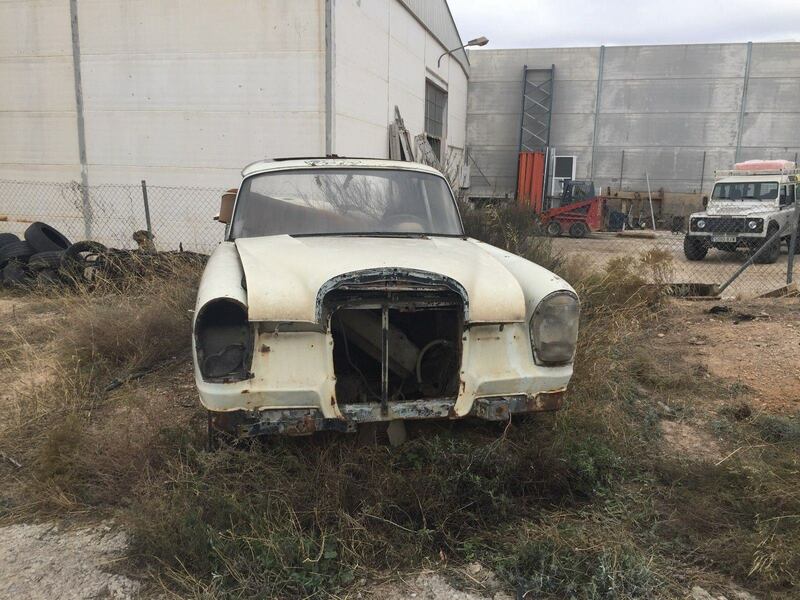 It does look as if Right Hand Drive versions are not rare https://www.ebay.co.uk/itm/Mercedes-220-SEB-W111-FINTAIL-STACKED-HEADLIGHT-MODEL-1963-/222789612102?_trksid=p2141725.m3641.l6368. Sadly the chances of rescue for this old girl are not looking high. At least not in the UK (There are no bids at the time of writing). Although it would be marvellous to be proved wrong. And to see the before and after photographs. Tip: take something to light sparklers with. I had high hopes of attending Kimbolton this year but it turns out the Catholic attempts at shrugging off Protestant repression occurred a whole day earlier than I thought. Sadly coincidentally with my seeing a couple of counselling clients. (Who (I imagined) might think it a bit rich if I sloped off to catch a few fireworks). Anyway so it was the 5th and fight my way into Cambridge (and choose between parking in a dinky car sized space or paying an Ivana Trump style fee for leaving my wheels somewhere). Alternatively something a bit more local and risk fireworks – the impressiveness of which probably wouldn’t disturb the wildlife much. And so I saw an advert for fireworks at Grafham (piggin’ close), ample on street parking (free) and £4 entry. This appealed to every cheapskate aspect of my personality. Of course it is dark around 11am now and this is profoundly disturbing to a large number of motorists I have discovered. Therefore I was pleasantly surprised when turning off at Great Staughton that we managed a steady 50mph all the way to the Grafham village turn. The event is surprisingly well subscribed and we joined a convoy on the access road which culminated in the inevitable car park when we reached the village. However there was a left turn which had something to do with the church – I figured we had legs. The decision turned out to be a good one as we parked just inside the village limits and were followed by lots of other motorists looking for some gridlock respite. The walk to the village hall had a frisson of excitement as I had no idea where it was. There was general milling around of tired taller people with excitable smaller ones. Eventually tagging along with a reasonable sized group of smaller people (at a distance I judged appropriate to avoid Rolf Harris accusations) led us out into a well-lit area. Where people were extracting us from our silver and permitting us access in one motion. It turned out that smaller persons were only £2 so something of a bargain if you have smaller persons that you intend to take. The field was already looking like the early stages of a concert venue and one person was doing a swift trade in packets of sparklers – something I cannot remember playing with since I was myself a smaller person. These were the ruinous amount of £1 for a packet of 5 (so we got two packets). I hadn’t thought to bring lighting devices so sidled over to a man who seemed capable of turning multiple sausages at once on a barbecue that the US airforce would have envied. We got the first sparkler lit but then instead of enjoying it I spent the remaining time anxiously lighting one after the other from it to ensure we had a means of lighting them. By this stage a healthy queue had developed and given the English love of queues I had to participate. We were queuing beside the QE2 sized barbecue and heading into a village hall so I had strong hopes of tea. The queue became porous as greater and greater numbers of people poured in and wanted intimate contact with the bonfire. Only accessible apparently by pushing past those queueing. The night was perishing windy and I was grateful for the surrounding houses which kept the autumnal blast down to merely finger biting proportions. After an interval – in which some members of the queue had evolved into other life forms – we got inside the door and saw the queue split in different directions. There was a sign saying mulled wine – tempting but no mulled wine was off. Later someone went in for mulled wine from the bonfire and I reflected that they really needed to up the volumes – a lot. There was hotdog, there was soup, there were baked potatoes. Hmm decisions decisions big stomach ache or really big stomach ache. (I have IBS so I’m not supposed to eat wheat or potatoes). So we opted for hotdog, which on a cold autumn night was frankly delicious in fact I had two of them. £1 each – another Grafham bargain. Volunteers were friendly and in frank amazement at the level of demand – food shifting at a rate of knots. I reassured them by telling them about the car parking demands and likely consequence for their ability to get out at the end. (I’m noted for my helpfulness). We emerged at the self-same moment the fireworks began with an enormous clap that should have accompanied the London New Year’s celebrations (and not a small fireworks display in a local village). After far too many pictures and fingers turning the shade of whitewash I had to put gloves on again – never thought iPhone gloves would be of any use till this. It was spectacular so many bangs you could have made a convincing run at the 1812 overture. So many wees and squeals that a room full of piglets with a megaphone would not have outdone it. Every time that I thought it was at an end another ffft-pow and a great hailstorm of light followed. Truly the best £4 I’ve spent of late. And then the silence of the expiry of a few thousand pounds of fireworks. Followed by much whooping and cheering from the taller persons assembled. (Smaller persons engaged with various highly-lit toys including some very impressive light-changing light sabres which I really wanted). So the crowds headed for the exit like some AC/DC concert exodus. Reason dictated that the tiny village exit road was now swamped with 4x4s and people carriers so we snuck over close to the dying fire. Just enough heat to warm the face not quite enough for toasty to properly set in. After a wait that just saw the worst of the crowds dissipate we headed out. Every road was a trail of red tail lights – it appeared I was going to get to know the best of Radio 4’s evening entertainment. However the choice of church lane turned out to have been an inadvertent masterstroke. Somehow we had parked in an area that had quickly cleared of cars. A quick turn into the village and it was out on the road we came in on. Not only that but 45mph was a reality – despite the obvious darkness. (There is no understanding the brazen guts of people is there). Following on from part three of the things you are going to find when you’re 50. It seems to you that you are on top of this technology business; you worked out how to use Facebook. WhatsApp turned out to be not so difficult. You are concerned though that you keep finding new technology that you’ve never heard of. The speed with which you’re supposed to learn new things seems laughable. You’ve sailed through 5 decades with the odd nose bleed and a scraped elbow. Now every minor snuffle lays you low for weeks on end. You start considering flu jabs as a great health investment. Embracing new things has always been you; every new thing; especially TV programmes. Surprising then how often you find yourself watching David Attenborough, Columbo or Murder She Wrote. Food is a source of experimentation for you. You’ve tried them all; from sushi to witchetty grubs. Nothing is too wild for you. Recently though intestinal complaints have been so violent you require compensatory plumbing. Oatmeal seems a really tasty idea suddenly. There’s no way that age can be a barrier to music appreciation. After some diligent listening to chart music you determine that one or two tracks are actually quite enjoyable. When you tell people about this they think it is hysterical. There is someone gorgeous on the street. A part of your mind reminds you that they could be your child or worse still your grandchild. Since the age of 18 you’ve been the same weight. Clothes fitted nicely. You could eat what you liked. You felt comfortable in your body. Now you notice the belt is tighter. The scales reveal a depressing story. The weight hangs around your waistline like an accusatory life-preserver. When you were younger you scoffed at all the silver hair; swearing you would dye it before it got to that stage. Now you realise there is a race between it falling out and changing colour. You become grateful for any hair whatever its colour.